Women and children first, well children anyway. 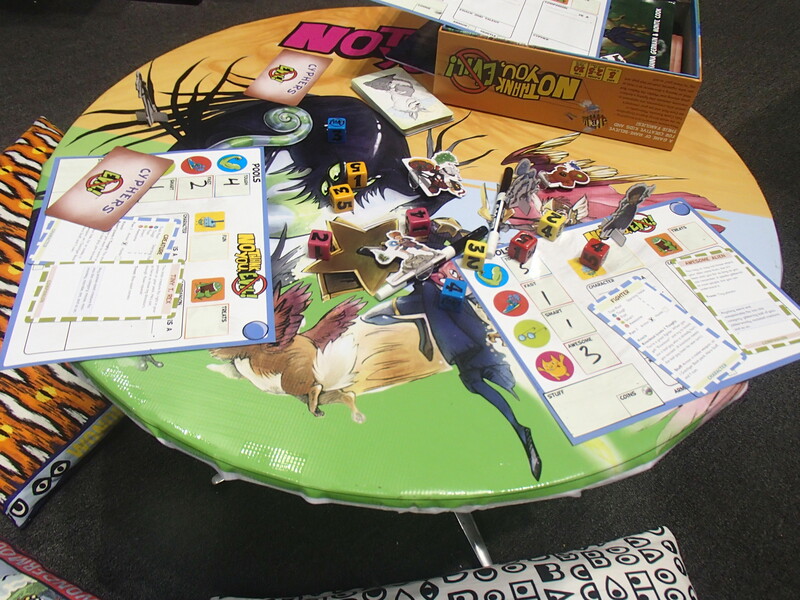 This year’s barrage of GenCon photos starts with all the games that I deemed best fit for kids, and there were a lot of them this year (mostly thanks to HABA and Peaceable Kingdom.) 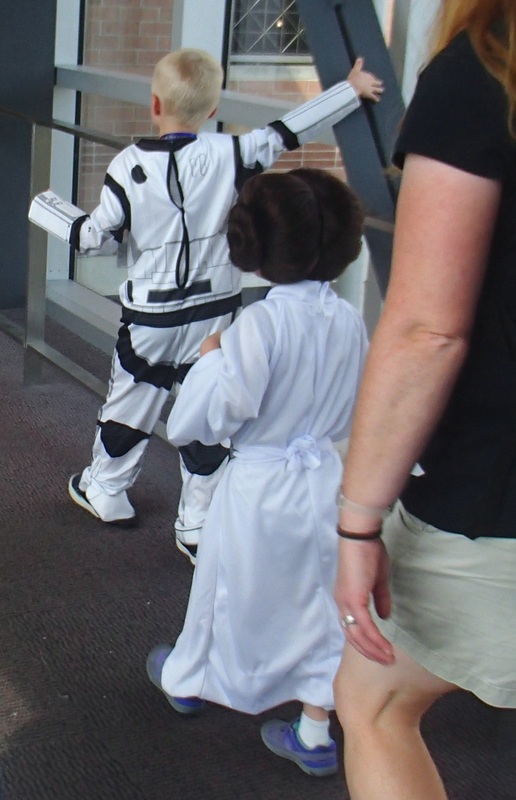 I’m sure there are games in my other GenCon posts that would work well with some kids (the party games, in particular) the following games (and role playing games) seemed to really target a younger age group. *Standard disclaimers apply. After learning the gist of the rules for over 100 games in two days, I will most likely mess up a small rule here or there, misspell a title, or attribute an incorrect publisher. Please humor me. At least I’m fairly sure I have the right names associated with the right photos… The following are alphabetical by publisher. Ticket to Ride: First Journey (Europe) will soon be available in the US. 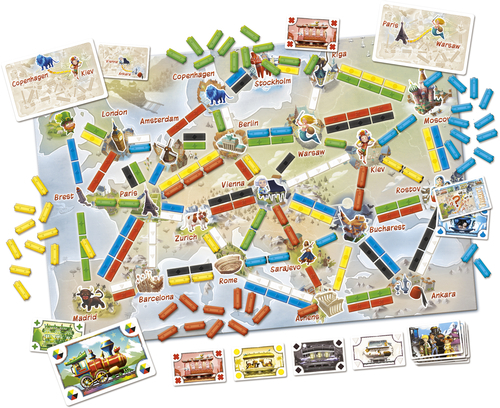 As with the US map, players draw cards and place trains in order to be the first to collect the required number of tickets, rather than competing for points. Game Salute had several titles in its family-targeted line, Flying Meeple. 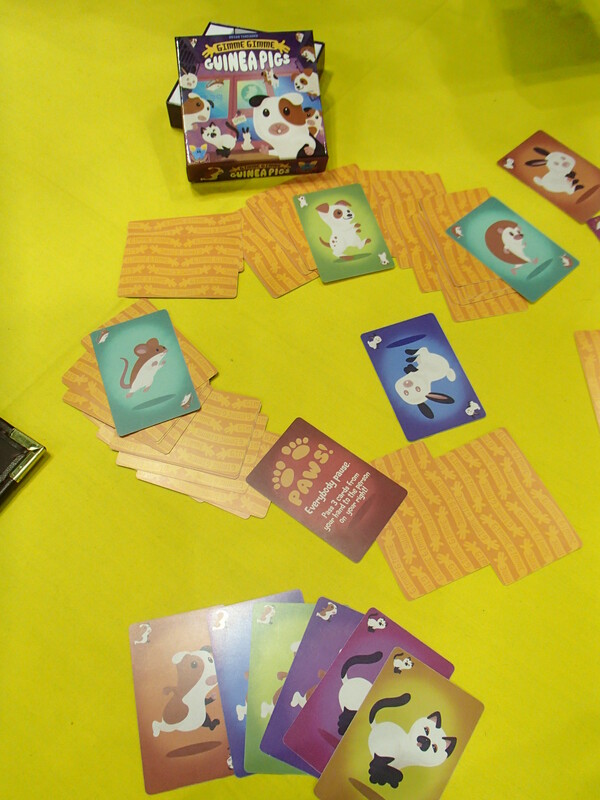 Gimme Gimme Guinea Pig is a real time card drawing game where players race to pick up cards from the table to complete a set of seven cards. Cards start face down but any discarded card must be placed face up, making it more likely an opponent can scoop up the cards they’re hunting for. The coolest “feature” to a game I saw all show was Dragon Tower. Players cooperate to save a princess from the game board tower. The first portion of the game is a memory matching game where players slowly build up a tower adjacent to the princess token. When the tower is complete, one pulls the string in a little dragon figure that is then attached to the bottom of the tower. Players must then race using little paddles to guide the princess token down out of the tower before the dragon’s string pulls out the structure’s supports. Mistakes made in the memory portion penalize players in second portion by giving the dragon less time before it collapses the tower. 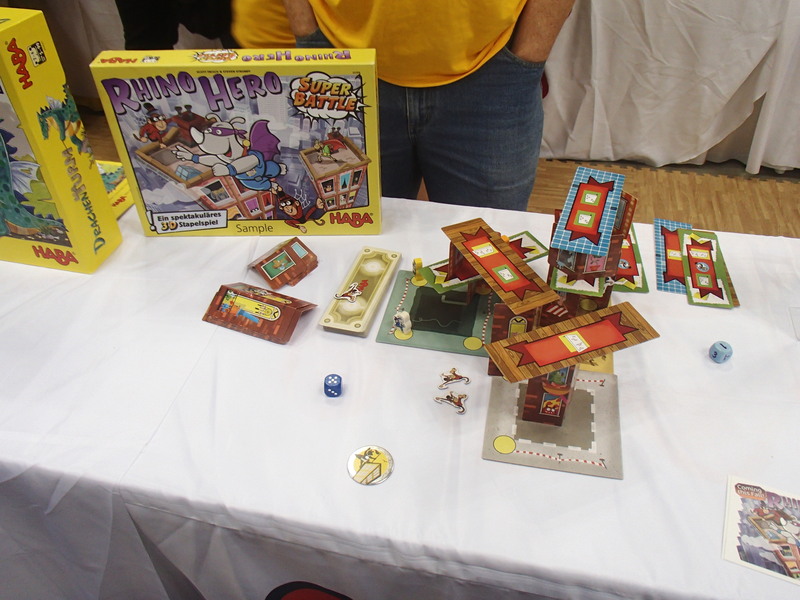 The popular game, Rhino Hero, is a cute little stacking game made entirely out of a deck of cards. Rhino Hero Super Battle takes everything up a notch. In this game players vie to have their token on the highest level of the structure when it finally falls over. 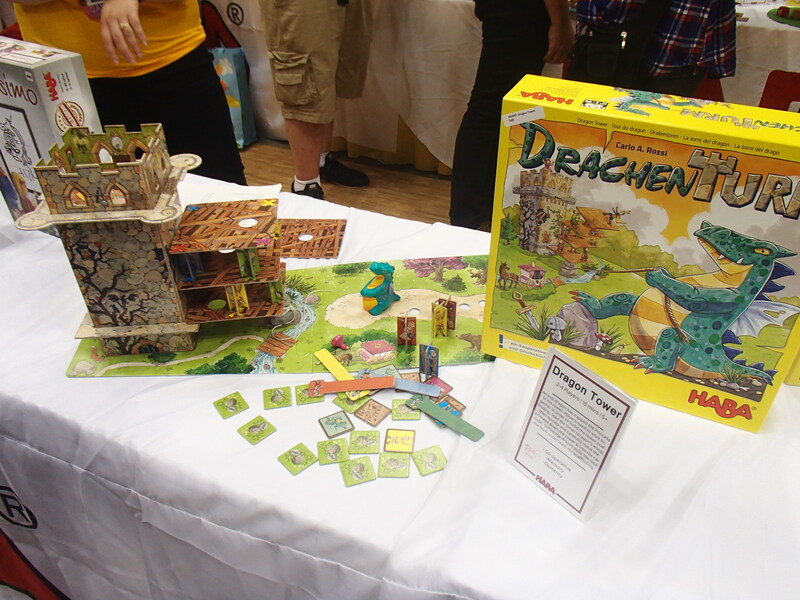 Players build a tower with cardboard pieces, using pieces as dictated from one of the three floor cards in their hand. The walls (not the floors) come in two sizes and each card will call for a specific pair of cards. Players place those two walls and then must balance a floor piece on top. However, no floor piece can be on exactly the same level as another (thus the need for multiple heights.) To complicate things, some cards require players to hang an additional monkey token off the tower. After placing, players roll a die to see if their token can move up or down the tower. Only one player can be on each level, so if two pieces end up on a level they have a roll-off to see who stays. The loser drops a level and may trigger another roll-off. I’m worried the token-fighting might bring in a bit too much luck, but the tower building is very cool. After a few short sentences into the explanation I realized Tiny Park is a reskin of Mummy’s Treasure, a game I enjoy and still own. Roll dice, reroll and/or keep die faces in order to pick up Tetris-like pieces containing matching symbols. Use the pieces to completely fill up your board and win the game. 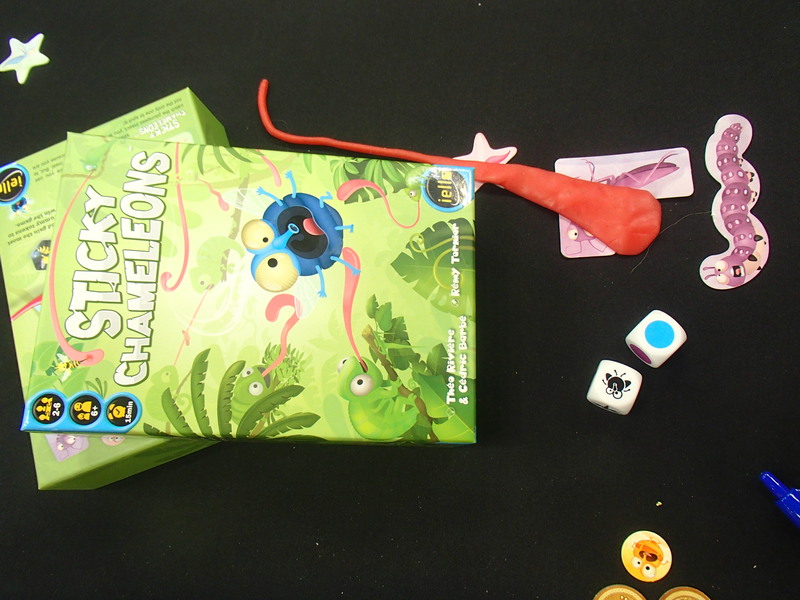 Some games are just silly fun, and Sticky Chameleon is one of them. Two dice are rolled to determine an object type and color. Players then use those “sticky hands” to try to grab matching cardboard tokens. Smacking your “tongue” onto someone else’s after they’ve tagged the target piece is just part of the fun. 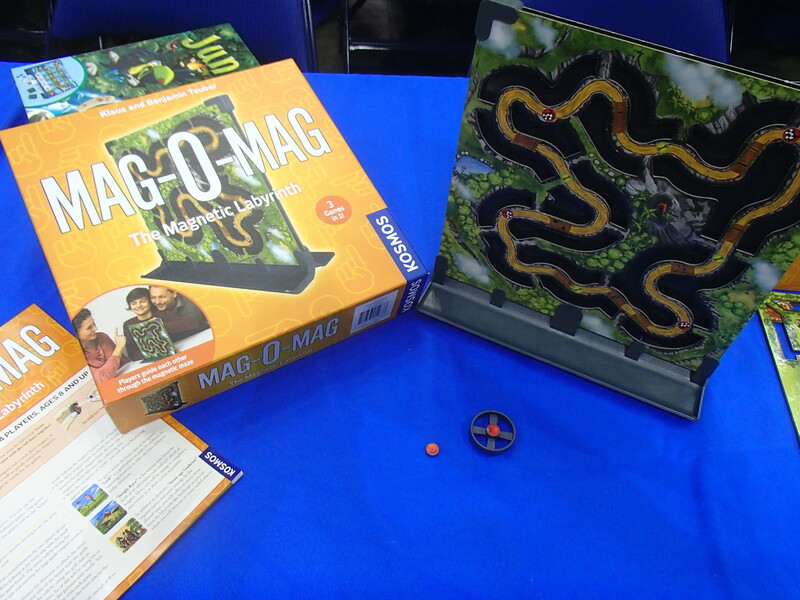 I saw a couple magnet-based games at the show and was able to take Mag-O-Mag home and test out. It is actually three games in one, with a different central board for each one. Two players face each other across a magnetic board. One player moves a magnet around on the back side and their partner tries to describe how they should move. The trick lies in the many openings punched into the board where the magnet can “fall off.” There are two sorts of racing games that are more time based and a golf game which is based on the number of “moves” done by the magnet mover. There is a bit of a trick to get the caller and mover to get into sync on movement and therein lies the fun. 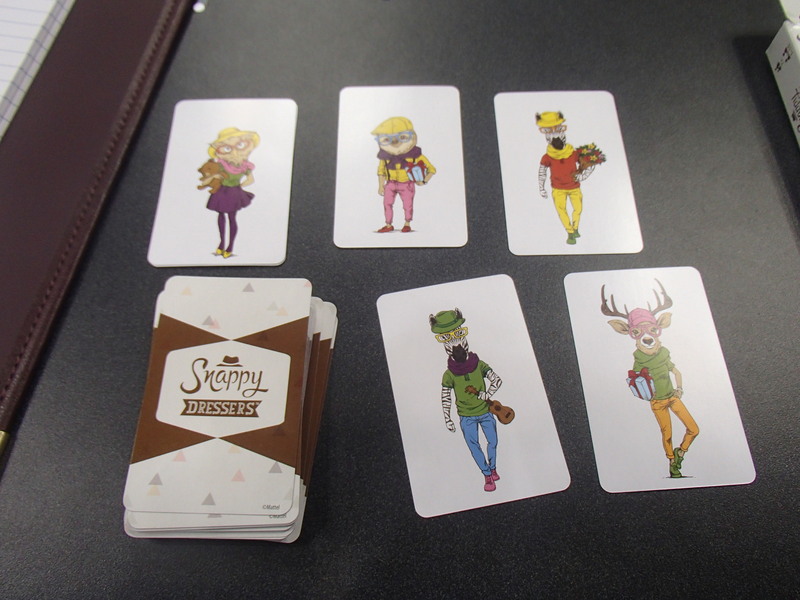 Snappy Dresser is another game in the “what is the same between two cards” genre. Cards contain various animal people dressed in colorful clothing. Watch the animal or the various clothing for matches. Rather than a single “Spot it” type game, there are 10 different games in the box. Another magnetic game, Mino & Tauri is a cooperative maze challenge. Players sit on each side of a vertical magnetic board and are allowed to move their piece anywhere along their own maze. 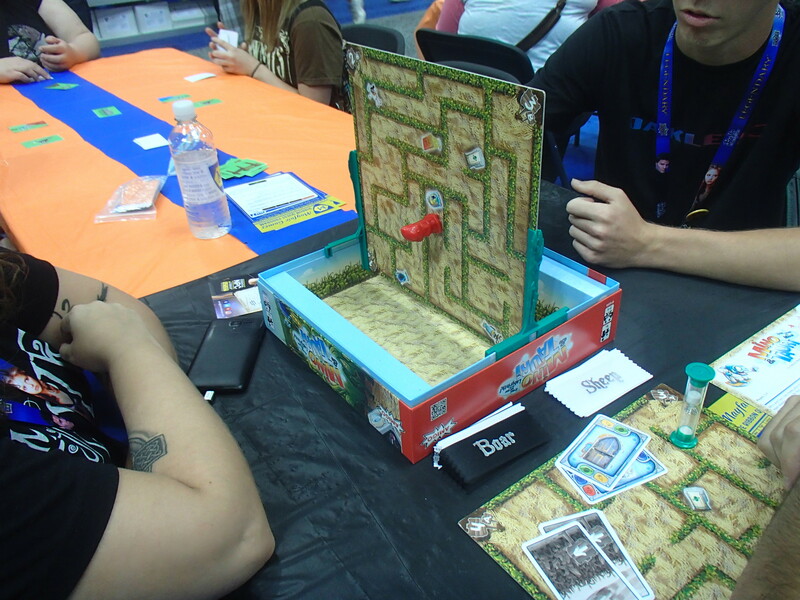 Their opponent has a different maze on their card so players can take turns moving the piece in order to reach new areas. (A player only has to obey their own maze, and can move the piece through the opponent’s hedges without penalty.) The game can be played “solo” with two players or two teams can challenge each other for the best time. An RPG targeted at kids, No Thank You Evil sets up kid versions of a role-playing experience including group problem solving and creation of story moments. Several different player options are included (and everyone gets their own companion to boot!) Players have values for statistics such as Tough, Fast, Smart, or Awesome (a sort of spirit of cooperation.) Players spend these stats throughout the game to help accomplish goals (through die rolls.) Three times per game, the group can spend a “fun point” to replenish everyone’s statistics values. Generally, the game is extremely forgiving, as if a player fails a task they can try again “a different way.” Combat is the one exception. Players roll one time against the monster’s level and if they are damaged they lose statistics points (starting with “tough”.) A friend recommended the game highly and it does look good for the very younger RPG set. 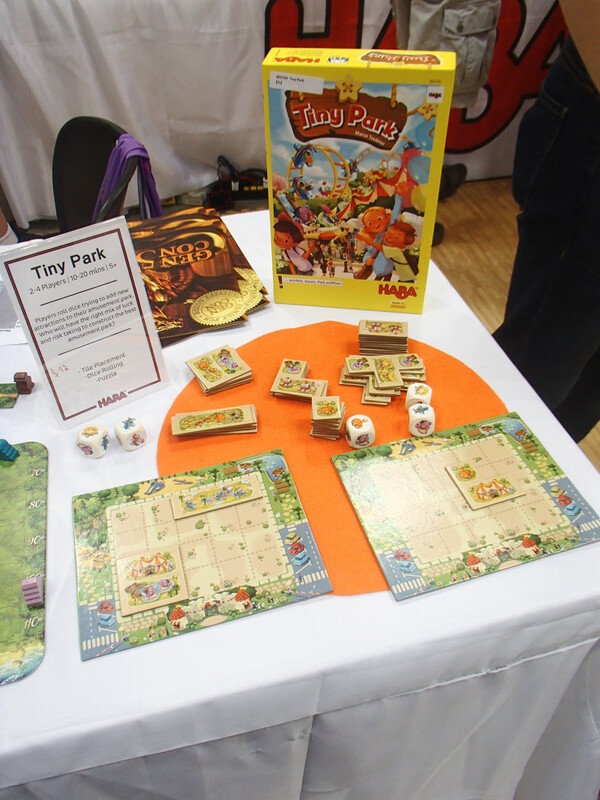 Peaceable Kingdom had a large booth at the convention full of kid-friendly games. 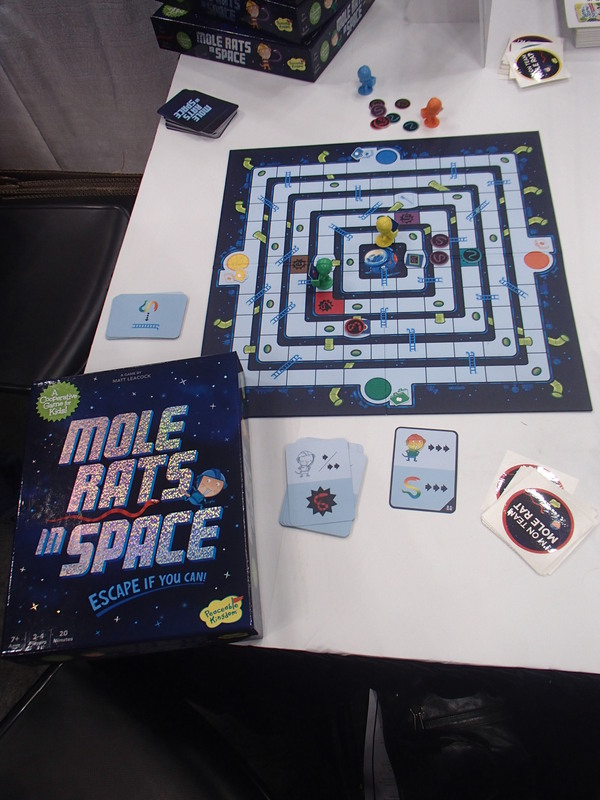 Their most prominent game was Mole Rats in Space, a cooperative game by Matt Leacock. Remenicent of Chutes and Ladders, the board is made of several concentric loops connected by ladders and chutes. Rather than rolling dice, movement is controlled by cards that dictate how many spaces they can move as well as how the enemy “snakes” move (how many spaces and which color snakes.) Decisions come in as players (and snakes) can move in either direction on thier loop, providing two choices for each action. 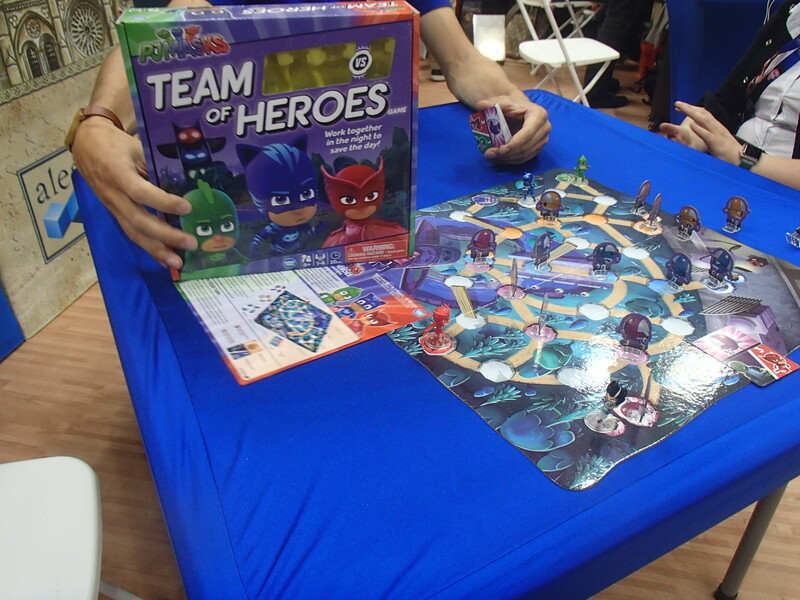 Players try to move around, gather four critical items, and make their way to the center of the board. They lose if a player is bitten twice, or a snake makes its way to the center (by climbing ladders.) Some chutes empty out into space so players need to avoid them but can move the snakes onto them to flush them from the ship. Unfortunately, some cards add more snakes to the board, cluttering things up. Planning and cooperation come into play as players draw their card at the end of their turn, so players always know what is going to happen in the next few rounds. A slightly more strategic Candyland, in Hoot Owl Hoot! 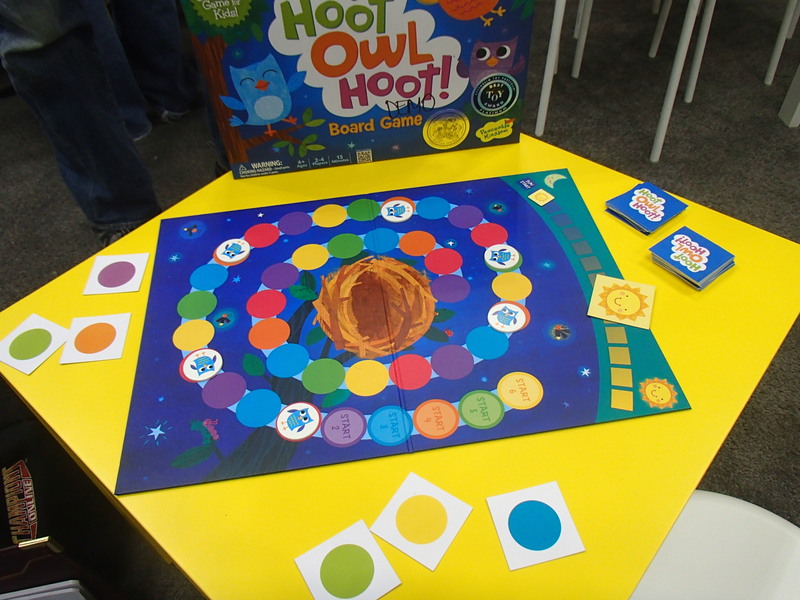 players cooperate to get their owls to the center of the board. Players chose one of three cards in their hand to move an owl forward to the first open space of that color, skipping any occupied spots of that color. Time pressure comes in through Sun cards which move the sun through the course of the night. 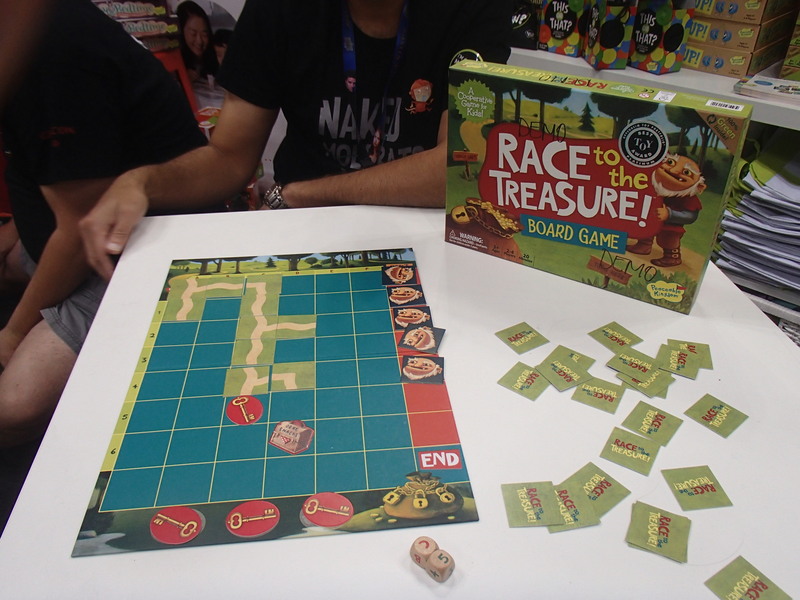 When drawn, a sun card moves the sun forward one space on the track and players lose if they don’t get all the owls to the mdidle by morning..
Race to the Treasure is a cooperative path laying game. Players take turns drawing a tile and then placing it on the board to extend the path currently showing. The goal is to create a path from one side of the board to the other, running over at least 3 of the 4 key tokens randomly placed on the board at the start of play. 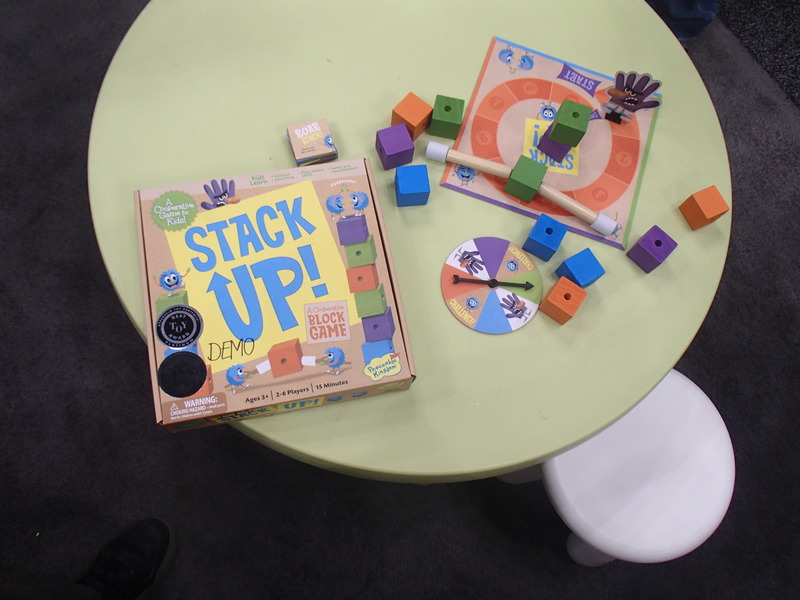 In Stack Up, (young) players take turns adding blocks to make a large tower before the hand token reaches the end of its track. Players spin the spinner and then either place a block, place a block while doing a challenge, or move the purple hand token forwad a step. Adding a block is fairly easy, but the challenges have you add a block while doing something silly at the same time, such as singing happy birthday, counting downwards from ten, or doing it with one hand behind your back. Note the two little sticks on the board, these can be stuck into the sides of blocks for yet another challenge to pickup and place blocks. 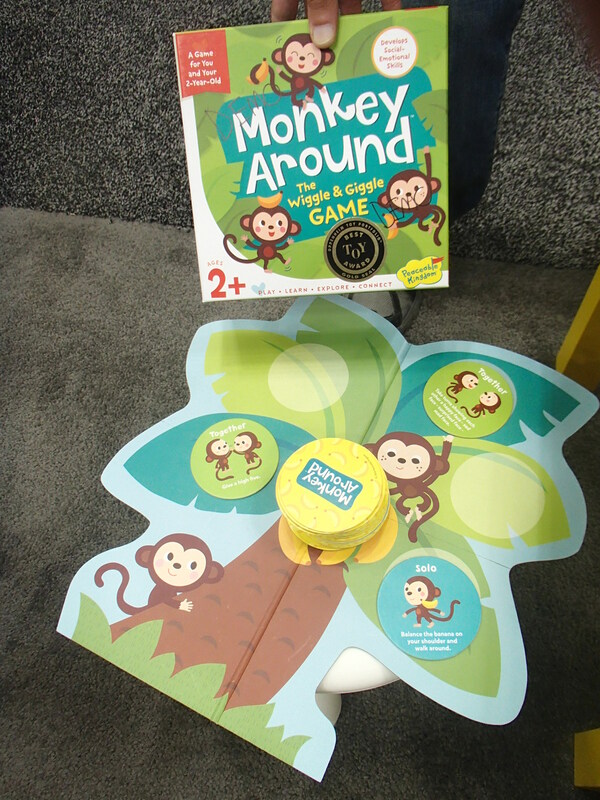 Monkey Around is one of three games targetted at ages as low as two. Monkey Around is a silly-style game. Pick up a circle, do what it says (pretend ot be a monkey, walk on your tiptoes, balance the banana beanbag on your shoulder, etc…) and then place the circle on the tree. Fill up the tree and “win” the game. Where’s Bear? sounds like a simple game, a bunch of nesting boxes and a wooden bear token… hide the bear token and guess where it is. What puts it beyond a funky Russian-Doll type item is the creative decorations on the boxes. 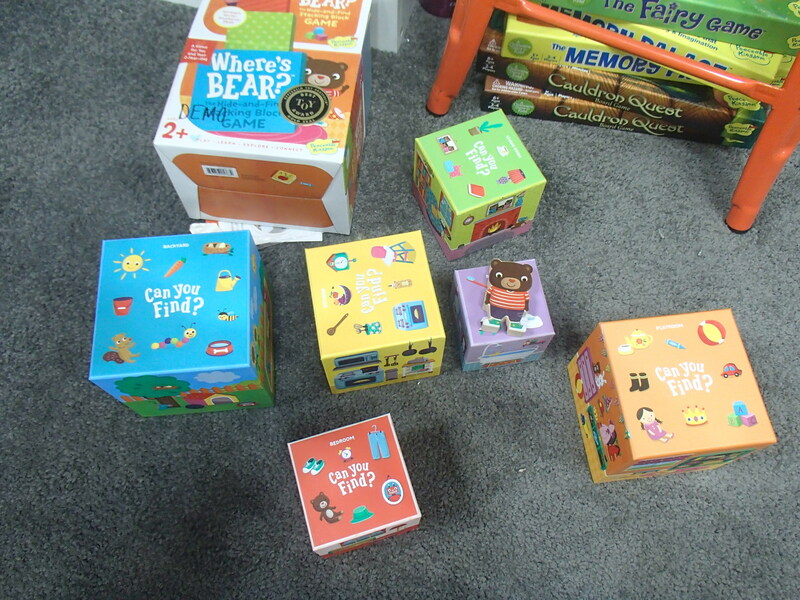 One can simply hide the bear and have the child look, but the boxes are also decorated in various household motifs. One can suggest “look for the bear in the bedroom” to have them find the right block or go for something more abstract like “the bear is where you brush your teeth” to indicate the block decorated with bathroom fixtures. 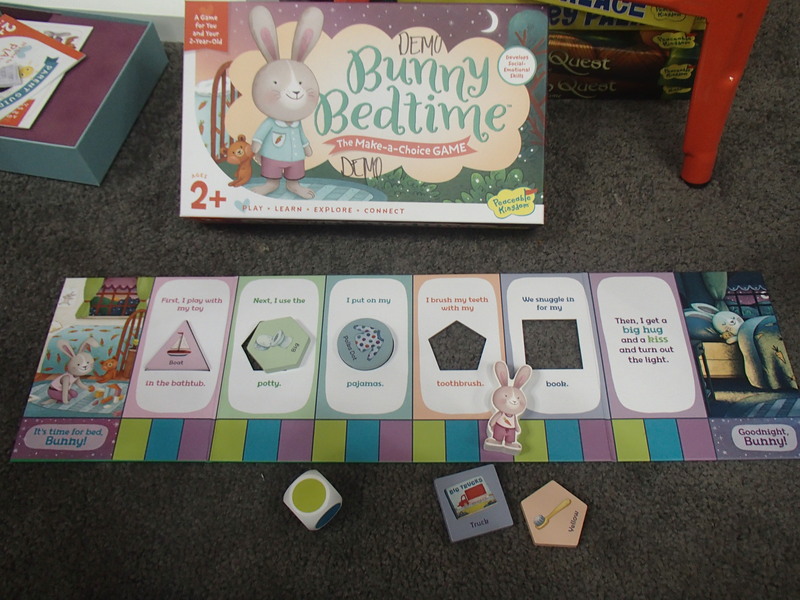 The last of the three beginner games is Bunny Bedtime. Half game and half puzzle, Bunny Bedtime is more of a parent-child activity. The child rolls a die, finds the matching shape, and then fits it into its slot on the game board. Fill up the slots, and “win” the game. While looking at some other RPG material I was introduced to the Playground Adventures line of products. 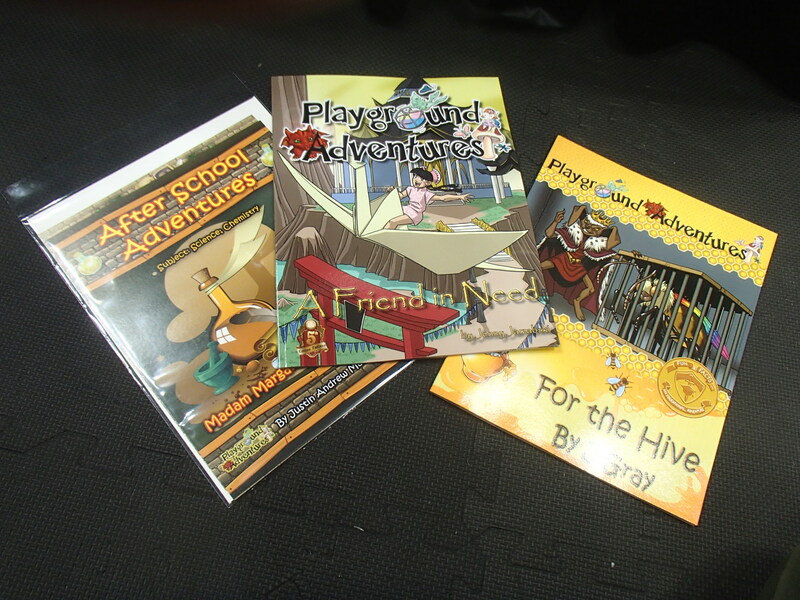 Specifically aimed at the young set (6+), Playground Adventures produce a line of kid-topic-friendly adventures compatible with the various popular RPGs systems (5th Edition D&D, Pathfinder, Hero Kids, and even PonyFinder (yes – Pathfinder rules with pony characters…) The books are well written, colorfull and have sidebars to help DMs deal with trickier bits of young gaming such as combat death and puzzle solving. I hope that’s enough kid-friendly goodness to last you awhile, I know my game dance card with my kids is already filled up for a good long while. Tomorrow, the RPGs of the show! This entry was posted in Convention Report, Reviews and tagged 2016, children, GenCon, Haba, Iello, kids, Kosmos, Mattel, Mayfair, Peaceable Kingdom, Playground Adventures, Wonderforge. Bookmark the permalink. Thanks. Since my “kids” are older I tend to pay less attention to this segment of the market. Good to see some quality designs out there! Thanks for highlighting Tiny Park – I’ve written previously about my love for Mummy’s Treasure and am glad to see it’s available to a new group of families/kids. I’ll also second a recommendation for Mole Rats in Space. Ticket to Ride First Journey has been available in the US for months. My four-year old grandson loves it! I’m sorry about that. I hadn’t seen the European map before, but it easily could have been released at Origins or sooner. My younger boy likes the US map. I’ll be happy to put some European geography into his brain with the European map.